Like a doting puppy, our Siberian waits at the door when he hears the garage door buzz. Mo joins us in bed for morning snuggles, and he kneads my tummy with his chubby paws. Mo plays with traditional toys, but there’s obviously nothing better than a box or a bag or a tray or a battery. He eats his kibble, but he really appreciates a rogue piece of raw chicken or shrimp. Growing up essentially pet-less (besides a couple of goldfish and that one gerbil), I can tell you that I’ve never known anything like the pure, uncomplicated love that I have for my Mo-Mo. I mean seriously. Look at dat face? Tell me about one of your beloved non-human family members. If you have a link to a photo/video/painting, please feel free to include it! PS: There’s still time to win an original piece of art. Interested? Click HERE. 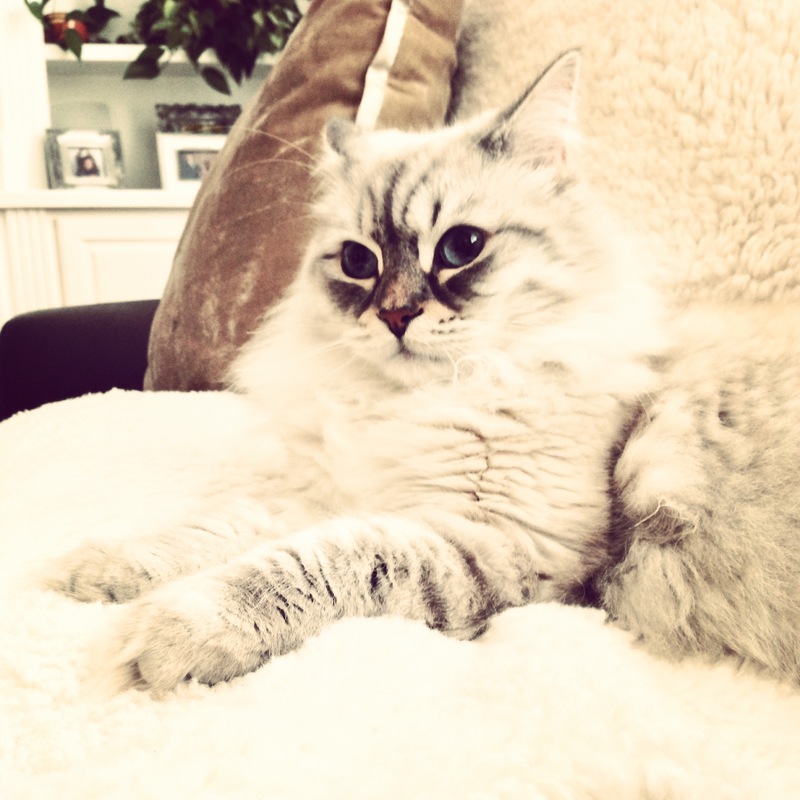 This entry was posted in Family, Relationships and tagged cats, SIberian, unconditional love. Bookmark the permalink. Our little ball of fluff has worked her way into our hearts and although she cannot express her past life into words, she has told us of that life in other ways. Besides her birth home, we were told she had lived in two different places before being abandoned to the Humane Society. Our home was the fifth place in the first eight months of her life. Miss Daisy, as we call her, is a beautiful-looking dog. She most definitely would have been the “pick of the litter”. Born in November, she may have been a Christmas gift. I can just see her – a cute, fluffy, white puppy with a red satin bow, sitting under the tree. We guess that because she was not housebroken, did not know how to play and was fearful of anyone extending their hand near her, she was likely kept in a cage for hours every day. Perhaps her owners worked away from their home and didn’t have time to train her. Perhaps she was hit with an open hand if she had an accident. They really didn’t want her. The wee girl was starved for affection but she has received an abundance of that since she came to live with us. It only took a few days for her to understand that her bodily functions had to take place outside and not on the carpets. Similarly, it took three days just for her to learn how to play. In her reluctance to chase or tug on a knotted sock, she displayed fear – fear of being reprimanded. She also showed intense fear if a man was wearing clothing of a certain colour. Perhaps one of her previous owners intimidated her while he was in work clothes. Yes, I realize that these are just guesses and assumptions, but having worked with this animal every day over the past three months, I’ve seen her fears and the subsequent changes in her behaviour and demeanour. She was introduced to our fenced-in back yard. At first, she wouldn’t stray far from the bottom step, but soon tasted the thrill of freedom. She ran. She would run until she was exhausted, with the wind in her fur, ears flying behind her. She sniffed the grass, followed ants with her nose, ate the flowers and picked up branches to run with. It was a true joy to see her come to life. Miss Daisy was not accustomed to strangers. She clung to us, trembling. We were just beginning to introduce her to people and other dogs when she came into heat. During that period, socialization was put on hold. She also had to suffer the indignity of wearing a doggie diaper, which she disliked intensely. The next indignity was her spay surgery and the protective collar she had to wear. Then one day she really changed. Miss Daisy wouldn’t eat or drink. She slept for hours. We had to carry her outside but she simply lay on the ground and slept. Worried, we brought her to Doc B who examined her carefully and gave us the news Miss Daisy was having a ‘ghost pregnancy’. Her hormones had gone askew. He told us she’d be fine in a few days and she was. All of the above has taken place in the first year of Miss Daisy’s life. She has met and loved playing with Sandii, Ruffles and Rory. She’s getting used to strangers. Because of her breed, she must be brushed and combed every single day, to prevent matted hair. However she is patient, knowing there will be a treat at the end. There are still occasional times she’ll duck and cringe if we try to pet her, but in time, we will have gained her trust. If I can convey just one thought from this column, it would be to anyone considering getting or giving a puppy as a Christmas gift – Don’t. An animal is not something to be discarded with the wrapping paper or when the novelty wears off. They need commitment, hours of training and play, but most of all, they need love. We are fortunate that Miss Daisy has come into our lives. She’s brought us laughter and love bundled up in nine pounds of fur. She’s found her “forever home” and we love her dearly. Wow Diane. That is an amazing story. Thank you for sharing it here. Our cat was a very carefully planned adoption, and he adjusted to life at our house without any difficulty. But you’re right, there were adjustments. We had to teach him to stay away from food on the kitchen table and we had to figure out who would handle food, who would handle grooming and – most importantly – who would handle de-pooping the litter box. But yes, adopting a pet is not a decision to be made lightly. Nice to meet you. I’m glad you made a wonderful home for Miss Daisy. Oh dear. Animals. Or fuzzies as our oldest refers to them as. We are buried in them. One day Ian, our middle child was walking home from work and heard a pitiful mewing. There was an adorable black and white kitten on the neighbour’s porch. He knew it wasn’t hers, because she didn’t like cats. So Bandit joined the household. Then Mark, our German Shepherd/Husky/Wolf cross died. Sammy, our other dog went into morning. He just wasn’t used to being alone. So we got Rose, a rescue dog to keep Sammy company. Rose was a puzzle at first, a beautiful dog who was distant. Then I saw her react to a kid whacking a snow bank with a stick. We are pretty certain Rose was abused. It took a while, but she came out of her shell, and is an incredibly affectionate doggie. We moved two years ago to the Far North. I think it was mid-October, when snow first starts to hit that we noticed an orange tabby hanging out on our porch. He was a bit skittish, but one night he got brave enough to get petted. I looked at his ribs, and decided to invite him in. He’s still here. Three months ago we saw a kitten looking out from under a tree across the road. We caught her, and took her to the local cat shelter. Two days later we saw a second kitten with the same markings in the same spot. We caught her too, and my son fell in love with her. She’s still here. Oh, and there’s the Siamese, the polydactyl tabby, the walking carpet (grey long haired cat), and the fat tabby. Yes, we have a lot of pets. And we love them all. Wayne. I love this tale about your pets. And I can’t imagine having all those critters in one house! You and your wife are amazing pet-owners with big hearts! We tried to have a polydactyl cat. He was awesome, but my husband was terribly allergic to him. I love that you are painting your wife’s black cat! Will you share the finished product with me? I’d really like to see it, as you can imagine. These days I’m extra interested in art that people create, even if they say they’re just dabbling. We dabblers have to stick together. Sure, I’ll scan the picture when it is done. I have no idea what it will turn out like, most of my prior work has been landscapes! Diane, I was thinking the same thing! I can’t imagine how much it must cost to take care of all those fuzzies. My house would be covered in hair, too! Lots of allergies in our house too. That’s why Miss Daisy is a Maltese/Shih-Tzu . BTW, when I read that your cal is called Sheldon, I immediately thought of Sheldon on the Big Bang Theory. Is she a know-it-all too? That is DMS Writer’s cat. She actually sent me a photo of her cat because she couldn’t get it to link up. OMG! So adorable. I would dare ssay that her cat is definitely a smarty-bo-bin-arty. Renee, your kitty Mo is a beauty! They can be such good company; Smokey the Wonder Cat is here on my lap now, and she is my writing muse and head cheerleader. I will try to find a picture of her…nice post, thanks! My non-human occupant is __________ and acts like ___________ way too early in the a.m., making ME act like ____________!! !